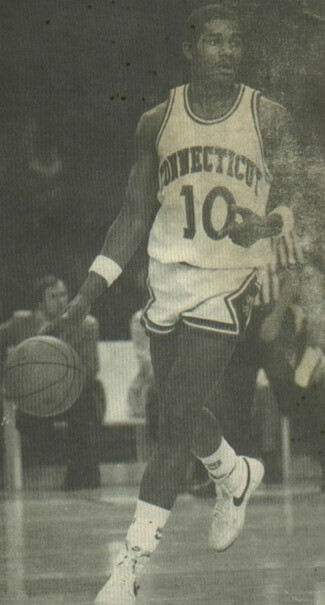 Earl Kelley was a Guard for the UConn Huskies from 1982 – 1986. He is No. 3 in career free throws made, No. 10 in assists and No. 11 in career scoring. Earl is also a member of the UConn Basketball All Century Team. In February of 2004 I caught up with him in his hometown of New Haven, CT where he reflected on his basketball experiences. Earl was born and raised in New Haven. He’s the youngest of 10 children, six boys and four girls. He was introduced to basketball by his brother Larry at the age of six. By age eight you couldn’t get a basketball out of Earl’s hands. He’d dribble through the house, he’d dribble on tough terrain, and he’d dribble everywhere and anywhere. Basketball became his passion. As a senior, the first game against Norwalk High, Earl scored 46 points before the three-point basket had been established. Earl still didn’t feel he was commanding the respect he deserved. The next four or five games he scored 38 points and during one game against Hamden High, Earl broke the school record with 55 points. Now all the college scouts wanted to know who Earl was. Over 100 Universities were interested; Hawaii, Pittsburgh, UConn, Syracuse, West Virginia, San Diego and Providence were among them. Earl chose UConn, which wasn’t too close nor too far from home. As a sophomore in the first four or five games Earl averaged 22 points per game. Then during the first Big East game against Syracuse, Earl stepped on Pearl Washington’s (Syracuse) foot and broke his own left ankle tearing two ligaments. He missed six weeks of basketball letting the ankle heal on its own. When he came back, after only two games, he broke his right ankle (he was favoring his right ankle too much because of his still weak left ankle). Earl had stopped suddenly and twisted it causing him to miss the remainder of the season. During Earl’s junior year, he average 19 points per game. He was second in scoring in the Big East behind Clyde Vaughan (current UConn assistant coach who played for Pittsburgh at the time). Earl was the Big East leading free throw shooter for the year and he made second team All Conference. As a senior the season started off strong. The team was winning and Earl was averaging 19 points, but something was missing that year. To this day, Earl can’t figure out what happened. The team was a good club but finished eighth in the Big East and didn’t make the National Collegiate Athletic Association Tournament. It was very disappointing. Earl felt that he deserved to have been playing in the National Basketball Association out of college. He was disappointed he wasn’t. Over the next three years he played overseas in Germany. Still disappointed that he wasn’t playing in the NBA, Earl decided to move back to the states where he settled in Baltimore, Maryland where one of his sisters lived for the next five years. He then came back to CT and played in the United States Basketball League for a team on Staten Island, NY and he played for the CT Basketball Association for a team in Rochester, MN. Earl has two sons, Earl Junior who is now 15 living in Baltimore, MD and is a singer not a basketball player. Earl’s other son Evan is 11 from Norwalk, CT who enjoys basketball and is very good at it. Earl has a fiancée, Jodi, of seven years who is his number one supporter and best friend. After giving up playing basketball, Earl pursued motivational speaking on basketball. He goes to many schools and basketball camps and talks to kids about the importance of education and the dangers of drugs. He wants kids to know that players are not invincible even though they sometimes think they are. “For the fans that thought I fell off the earth, I’m alright. I’m hanging in there.” Earl is also working on a project where he plans to help kids with basketball fundamentals, getting back to basics. Earl shared his thoughts on the current team making it to the Final Four. “The team is not mentally tough enough. I believe they will make it to the Final Four but they have to get tougher mentally.” He feels UConn’s National Championship in 1999 was a wonderful thing. “I’d like to think that although some of us were not involved in the championship game, we all played a part.” He thinks Coach Calhoun is among the top five coaches in the country, hands down, and more important, he is a tremendous, wonderful person. Earl believes that every player becomes a better man because of Coach Calhoun. Speaking of his own coach at UConn, Earl said that Coach Dom Perno was an excellent coach for him. He was a wonderful person and his family treated the players like family.